WASHINGTON (CNS) — At a March 15 Mass in Washington marking the 34th anniversary of the killing of Salvadoran Archbishop Oscar Romero, Auxiliary Bishop Gregorio Rosa Chavez of San Salvador said there’s strong hope and signals from the Vatican that beatification for the man many consider a modern-day saint will come in three years. Bishop Rosa Chavez, a contemporary of Archbishop Romero, spent the weekend visiting various parishes in the Washington area that were remembering the life and the circumstances of Archbishop Romero’s death. He was killed March 24, 1980, while celebrating Mass. He was an ardent voice against violence and publicly denounced the circumstances that led to unfair economic conditions for the poor of El Salvador. “This news brought us great happiness and hope that (Archbishop Romero) will be in the highest of altars to serve as an example for all Christians,” said Capuchin Franciscan Father Moises Villalta, pastor of the Shrine of the Sacred Heart, where Bishop Rosa Chavez spoke. The parish serves a largely Salvadoran population in Washington that includes hundreds of families and individuals who fled the civil war in El Salvador in the 1980s and the early 1990s. The conflict in El Salvador lasted from roughly 1979 to 1992 and more than 75,000 Salvadorans, including Archbishop Romero, were killed, according to the United Nations. Many civilians left the tiny Central American country and fled for protection to the United States, Europe and Australia, among other places. Others were “disappeared” and have never been found. 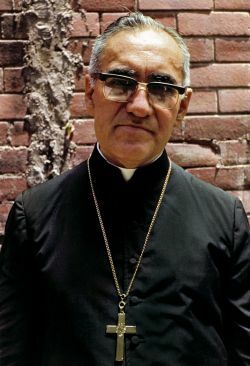 The bishop told Catholic News Service that even though he and other Salvadorans and Latin Americans have never doubted that Archbishop Romero is a saint, he had wondered in the past whether the church would ever officially recognize it. “I had doubts,” he said, but now there is no doubt at all that one day he’ll be an official saint of the church. “Even the pope himself is desirous and convinced that (Romero) is a saint and martyr,” Bishop Rosa Chavez said, referring to a comment that then-Cardinal Jorge Mario Bergoglio, now Pope Francis, made in Aparecida, Brazil, during a general meeting of the Latin American bishops in 2007. For the process toward sainthood to continue, the pope needs to formally declare Archbishop Romero a martyr, meaning he died for the faith. A miracle attributed to a sainthood candidate’s intercession is not needed for the beatification of a martyr. But a miracle would be needed for his canonization. 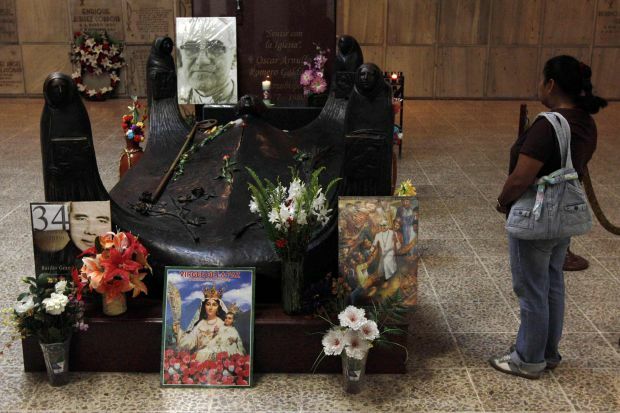 The church has had questions about whether Archbishop Romero was killed for his faith or for his political stance. And there has been concern that he has been used as a political symbol rather than a religious symbol in El Salvador. Italian Archbishop Vincenzo Paglia, president of the Pontifical Council for the Family and the postulator of Archbishop Romero’s cause, confirmed in April 2013 that the path toward his beatification would go forward. Since then, Archbishop Paglia’s office has been tight-lipped, declaring only that no more would be said about Archbishop Romero’s case until there was more “concrete” information.